Dutch health care giant Philips on Tuesday announced the launch of Lumify, a portable, app-based ultrasound solution compatible with Android mobile devices, in South Korea. According to the company, Lumify delivers data acquired via portable ultrasound transducers to connected Android devices through a mobile app, allowing health care providers to deliver ultrasound scans anywhere, anytime. In short, they would not need to access a cart-based ultrasound system. Philips had originally launched Lumify US in 2015 as the world’s first app-based portable ultrasound solution. The digital health product has belatedly arrived in Korea. 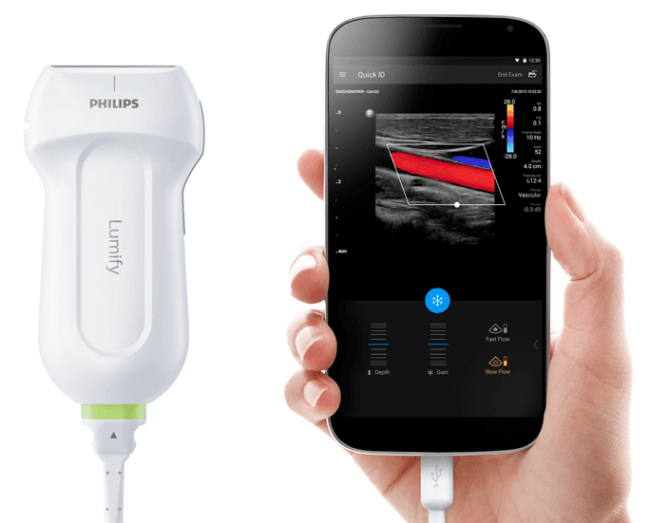 Lumify is the first Philips ultrasound device for pre-hospital use and supports clinical applications including cardiac and abdominal use, according to Philips Korea. “Philips’ vision for app-based ultrasound is focused on putting high-quality devices in the hands of more professionals to serve more patients in more locations,” said Hwang Kyu-tae, head of the ultrasound business at Philips Korea. Lumify solutions include the Lumify app and three transducers -- L12-4, C5-2, and S4-1. Users can download the app from the Google Play store, connect the transducers to their compatible smart device and begin scanning. Data are transferred and stored via cloud technology.